Patrick `PJ’ Jones, left, hands over the table tennis equipment to secretary of the Guyana Table Tennis Association, Linden Johnson recently at the Cliff Anderson Sports Hall in the presence of national players Joel Alleyne and Nigel Bryan. 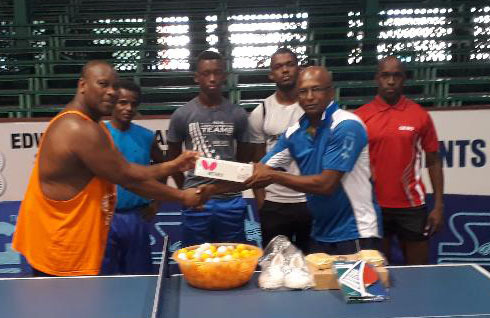 Canada-based Patrick `PJ’ Jones, a former top table tennis player from the Young Achievers Table Tennis Club has donated a quantity of equipment, (balls, racquets and sneakers) to the Guyana Table Tennis Association (GTTA). Jones, a southpaw, was a devastating player in the early 1980’s when he teamed up with players like Junior Cameron, former national junior champion Mark Chung, the O’Reilly brothers Colin and Christopher `Fire Red’ and Owen Wilkinson, to form one of the toughest clubs in Guyana. “On behalf of myself, Marliss and my wife Roxanne, it’s an honour and a privilege for me to give to the association in Guyana this equipment,” Jones said on a visit to Guyana recently. Jones said he was heartened by the recent performances of the Guyana men and women’s teams which placed second at the recent annual Caribbean TT Championships in Jamaica. 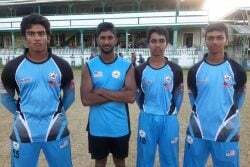 “I want to congratulate the Guyana team in their future endeavours and I hope for continued success,” he said.